We spoke to all our shortlisted candidates to find out a bit more about the three businesses that are in the running for the 2018 trader of the year award. Our three shortlisted businesses have to wait until the final award ceremony in London on 23 May to find out who will be crowned the 2018 trader of the year. The ceremony celebrates businesses that go above and beyond to provide excellent customer service in a variety of fields. It often includes some major corporations, many of which go on to use the award in their advertising for the next 12 months. For the winning business it’s an opportunity to set itself above the thousands of others on the Which? Trusted Traders scheme, showing that is really is the best of the best when it comes to customer service and engagement with Which? and its ideals. Trader of the year is a popular award, traditionally closing the ceremony and rewarding a smaller business in amongst some of the giants of the corporate world. 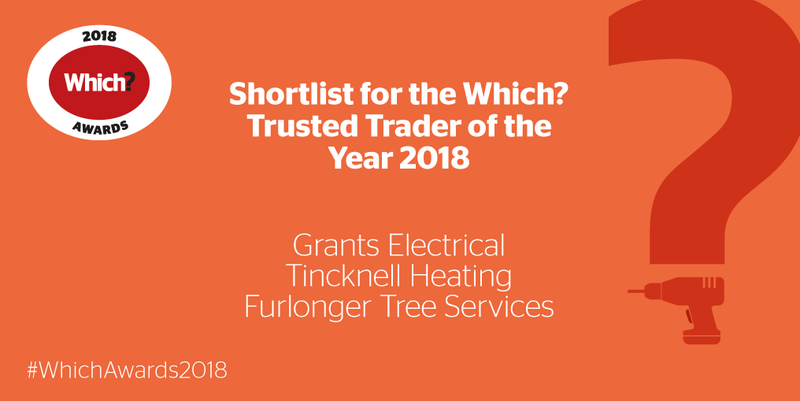 The shortlist announcement revealed that there are three candidates in the running this year: Furlonger Tree Services, Grants Electrical Services, and Tincknell Heating Services. The award was established in 2015 – you can find out more about the experiences of our three previous winners, or read on for more on this year’s nominees. Furlonger Tree Services is based in Box Hill, Surrey. It provides a full range of tree work – including stump grinding, tree reduction, tree felling, and supplying logs – in Surrey, West Sussex, and areas of London close to its base. Tom Furlonger established the business in 2004, and it’s grown to the point where Furlonger Tree Services has three permanent employees plus regular contractors. The team pride themselves on going the extra mile. Ensuring customers are happy with the service they provide, from the level of communication to the tree work, comes as standard. But if they can give something extra, then they will do so. A great example is at a recent job, where a tree that had been planted in memory of the customer’s mother needed to be felled after it had grown too big. Tom carved a replica of a Christmas tree from the wood, and gave it to the customer as a memento of this special tree. You can read the review from the delighted customer on the Furlonger Tree Services profile page. Furlonger Tree Services joined Which? Trusted Traders in 2015. The business has thoroughly embraced the scheme, handing out the Code of Conduct to each customer at the start of a job and using the logo on business cards, workwear, all artwork and on social media. Find out more about how to get more reviews on your profile, or get some tips on asking for customer feedback. Grants Electrical Services is a relatively new business. Ex-army avionics electrician Martin Grant set up as an electrician in Calne, near Chippenham, three years ago after leaving the army. The business now has two full-time employees and two directors, plus external administrative support, and Martin and his team tackle domestic electrical work all over Wiltshire. Follow our tips to make the most of your endorsement, or see how you can use social media to boost your business. Want to start your journey towards the trader of the year ceremony? Find out how you could be the next Which? Trusted trader of the month. Tincknell Heating Services was established in 1960. It’s part of the family-run Tincknell Fuel Group, which has been in business since 1925, serving the farming community in Somerset. 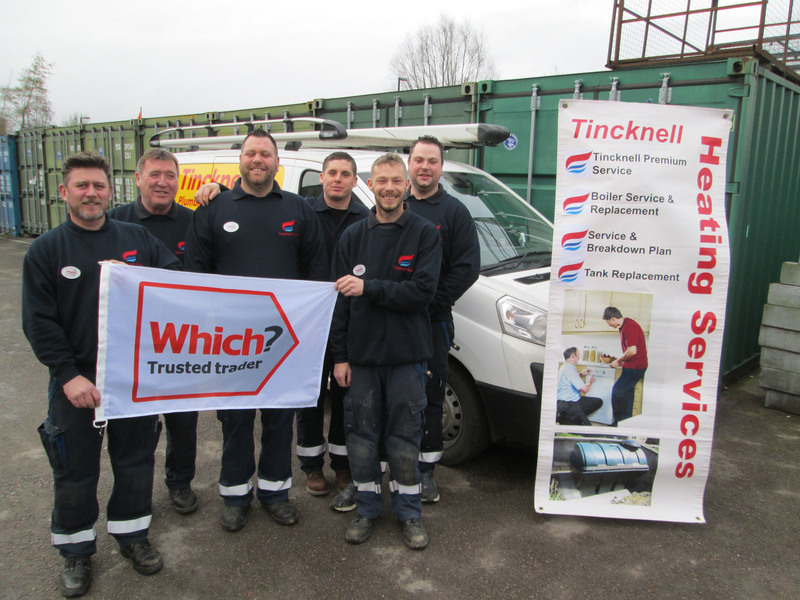 These days, Tincknell Heating Services has 25 employees, and provides boiler installations and plumbing across Somerset, Wiltshire, Dorset, Avon and south Gloucestershire. Tincknell Heating Services has really embraced the Which? Trusted Traders scheme. It makes great use of the Which? Trusted trader logo, using it prominently in its reception area, on screens, in advertising, online and on its vehicles. It also consciously works hard to get reviews for its work. Check our tips about how to use your Which? Trusted trader icon or getting the best pictures on your Which? Trusted trader profile. The business supplies a feedback form with its handover pack at the end of each installation, along with a bouquet of flowers to each customer who has had a boiler installed. The team are keen to take the time to ensure customers are happy with their service, and want to know about any issues that may arise. Customer feedback helps them to directly improve their service. Nick responds to all the reviews left on the Which? Trusted Traders website, and the team print them out and put them on a noticeboard in the office, to share the positive news with the whole team. The great reviews help to generate business, too, with a substantial number of potential customers finding the business on the site. Best of luck to all three nominees. We’ll bring you all the news about the trader of the year award from the Which? awards ceremony on Facebook and Twitter on the day. There will also be a report here on the site following the ceremony on 23 May.